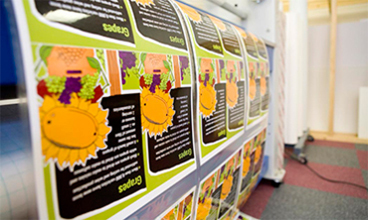 The handling and finishing of large printed material requires a specialist knowledge. Our conscientious and experienced team take great pride and care in their work and have all the facilities they need to make sure everything runs smoothly, looks terrific and gets to you on time. You can feel confident that we will offer you the best possible service. Click here to see what some of our customers have to say. To protect large format prints we can overlaminate one or both sides in a gloss, matt or deep crystal (scratch resistant) finish and depending on the end user's requirement apply self adhesive backing and mount onto flexible card, lightweight polyboard, rigid pvc foamex or aluminum di-bond. Overlaminating will enhance the printed surface and provide physical protection against fingerprints, scratches and abrasions. In addition the work is guaranteed anti-fade due to UV stabilisers contained within the film. Even under the harshest lighting conditions the visual characteristics of the work will not change. We will ensure that all items are well protected for delivery and our chosen courier company uses online tracking which gives us and the customer the current status of any particular consignment. For exceptionally large and awkward shaped consignments we employ the services of a well trusted transportation company giving total peace of mind with our deliveries.